There’s nothing quite like a meal at Glimmerglass. The ambiance, attention to detail, and quality of the dishes is unmatched in the local area. Glimmerglass has been a longstanding special occasion destination and we recently had the chance to sit down with Gordon Clarkson, Director of Food & Beverage and Event Management, to talk about why. Here’s his thoughts on how Glimmerglass has become such an iconic restaurant for couples and families. Glimmerglass has made some significant changes over the last several years, how would you characterize them? Glimmerglass has become far more accessible to the general public. In the past, it was more reserved for hotel guests, but people are starting to recognize that it is a fantastic restaurant for locals also. Breakfast and brunch have always been popular, but dinner has emerged as a terrific option for tourists and locals alike. It’s become clear that Glimmerglass can stand beside any restaurant in the county for creative food, service and ambiance. Of all of the amazing meals on the menu, what is your personal favorite? The 28 Day Dry Aged Rib Eye Steak. We age the beef in house and butcher the selected cuts ourselves.The bottom line is - the steak melts in your mouth and is incredible. Can you recall some of the most memorable moments with customers at Glimmerglass? It seems wedding proposals are always happening. No “nos” yet. We even had a few couples who have booked the wedding at The Otesaga after a successful proposal. My recent favorite, we held a “101st birthday” that included four generations; one turning 100 and the great-great-granddaughter for her first birthday. It was touching and memorable for our entire team, and hopefully for the family as well. What is your #1 piece of advice for people planning a meal or special occasion at Glimmerglass? We urge our guests to try something different. The in-house dry aged beef is second-to-none. I also always enjoy the Koji Roasted Chicken. We also encourage guests to make sure to step out onto the veranda and linger a little before or after your meal, if you get the chance. Take in the sunset, grab a cocktail and relax - the views are spectacular. With beautiful, stunning lake views, Glimmerglass is the perfect place for any meal that needs just a little something extra. Local produce, products, beers, wine and more fill the menu - so each meal is memorable not only for the food, but those who you spend it with. 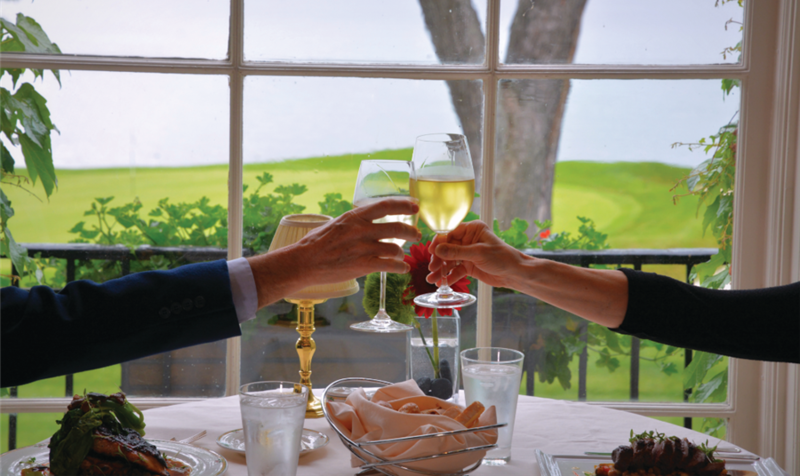 Gone are the old days of formal dress codes and hotel guest only reservations - now, all are welcome to experience Chef Perillo’s creative culinary flair, the spectacular view and the gracious hospitality that has made The Otesaga a sought after destination since 1909. To make reservations, please call 607-544-2519.